Affiliated supports Mother Angeline McCrory Manor with Engineering Services that answer mandates, expanding IT capabilities, and deliver a new level of excellence for residents. Completed in the 2005, Mother Angeline McCrory Manor is a 147-bed Skilled Nursing Home providing care for the elderly of Columbus and Central Ohio. 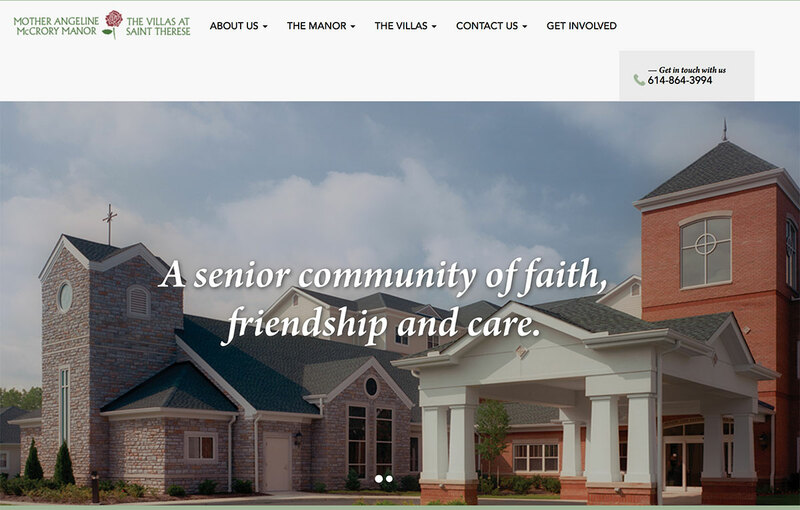 Next door is The Villas at St. Therese, an Independent and Assisted Living facility established in 1998. Together, the facilities deliver a continuum of care in a campus-like setting. When Penny Harris came on board as IT Director, the challenges were clear. “First, we didn’t have Wi-Fi and other key capabilities,” she recalls. “There was a lot to accomplish, and it was just me and an outside group I’d inherited.” To complicate the issue, her organization was transitioning with a new parent group that was running 16 other similar facilities in the US and Ireland. "Until then, every home was its own home and we didn’t answer to others," Harris says. "But when corporate came in they wanted everyone on the same page, with the right stuff, so we had to update our IT infrastructure." Harris needed to free her systems from the former parent company and create new infrastructure to support her applications, operations, and users. Another mandate was to implement Microsoft Office 365 to support email and collaboration capabilities via the cloud. As a first step in the transition, the Microsoft active directory/domain would have to be set up and then the applications could be moved to a new infrastructure. Harris’s first call was to Affiliated, a technology services company in Dublin, Ohio, which supports organizations with small IT teams, and has the experienced IT resources they need to be successful. "They’ve provided support just about everywhere I’ve worked over the past 20 years and I’ve always had great results," she says. Initial meetings lead to a Managed Services Agreement, to provide troubleshooting for a monthly fee. But as new IT and new corporate demands surfaced, it was necessary to add on Engineering Services. "Around this time corporate directed that we bring on Electronic Medical Records (EMR) for nurses, so we needed help with that," she says. Now Affiliated delivers support and after hours assistance to ensure that Mother Angeline McCrory Manor’s Point Click Care application is performing for staff around the clock. “All of our aides depend on Point Click for care orders and drugs, and it tracks everything we give our residents,” she says. "It’s a huge system that integrates with the pharmacy, and has so much capability we’re even using it for accounts payable and receivable." And since EMR was coming, her organization needed remote laptops. "This was huge, we had to provide more computers and laptops where cards had to be wireless," she says. Affiliated has upgraded the infrastructure to a virtual desktop environment for improved IT management and support. Today Harris has the scalability and flexibility to manage her applications faster and more effectively. "Before it was taking me a day to set up a new workstation, but now I can just get on a workstation and go," she says. Along with the virtual desktops, Affiliated updated the wireless to give nurses full access to each room for care and management of Rx and general services. “If we didn’t have wireless and virtual desktops, we couldn’t do what we do right now.” She says. Affiliated also improved the backup solution, so it’s now more secure and Harris can manage backups with redundant locations. Affiliated has also upgraded the network and switch infrastructure by implementing best practices that more effectively manage wireless, phones, data, and internet activity. Harris says she values the support she receives from Affiliated, and how it has impacted her organization. “I simply tell them this is the kind of problem I’m having and they go fix it. So really, it saves us from having another person here.” It also saves her time. “Affiliated is always ready to work around my schedule, which is very nice that they‘ll accommodate me.” She says. Does Harris consider this to be an unexpected benefit of working with Affiliated? "No. Saw that coming. We’d talked about it in our early planning, which Affiliated is very good at." "We’re part of a 17-facility system, and with the technology and support we have now, colleagues say we’re Number 1. We’re just so much farther along than any other home, and I believe a lot of that success has to do with Affiliated." A Skilled Nursing Home facility, operating semi-autonomously within a group of sister companies, found itself reporting to new corporate leadership. They needed to respond to new corporate mandates and better align IT with business objectives. And they needed help quickly. Expanded IT capabilities without having to add additional resources; saves on labor costs and training; and enables IT director to focus on new initiatives with the confidence that key projects, processes, and support are in capable hands. "Affiliated has been good for us, we work well together, and their response time is excellent. Zero problems. Affiliated has proven time and time again that they deliver."